A few steps away, one of downtown’s most prominent LEED-certified buildings, the Nashville Bridge Building, rises from the riverbank in the shadow of LP Field, the city’s NFL stadium. Before its recent renovation and transformation into an event space, the century-old Bridge Building sat derelict for years. Like much of downtown and other parts of the city, it was submerged by the May 2010 flood that killed 11 people and caused $2 billion in damage. Since then, portions of the Cumberland River that flow through Nashville from Old Hickory Dam to Bells Bend have begun a continuing transformation from commercial sites into parks and playgrounds. The new children’s park, Cumberland Park, is one example. Cornelia Fort Airpark is another. The private riverside airport, destroyed by the flood, is now part of a public greenway. “We have made significant investments to improve the riverfront, including the Riverfront Master Plan and Cumberland Park,” Mayor Karl Dean says. “Cumberland Park incorporates the natural beauty of the river into its design and, since its opening earlier this year, people have more opportunities to be near the river. Possible projects to protect the riverfront surfaced earlier this week, including constructing a removable six-foot floodwall for downtown. The floodwall’s price tag at tens of millions of dollars could take years to study, fund and implement. Other ideas have emerged for possible feasibility studies such as having downtown businesses elevate inventory. Metro could offer additional buyouts of property in heavily flood-damaged areas and elevate homes by adding stair steps to raise them “above the base flood elevation’’ in neighborhoods that received less damage. Local engineer Shannon Lambert, who is working on the project with Metro, says flood-proofing by raising utility and power lines, as well as inventory, offers a less expensive way of protecting businesses and homes. All potential projects will be studied by both Metro and the Army Corps of Engineers. The transformation of the banks of the Cumberland River has been assisted by the wariness of the private sector. Since the river demonstrated its power during the flood, no large commercial development has been proposed on its banks. Meanwhile, the city is spending millions of dollars on public projects. It’s no surprise that developers of office space aren’t interested in developing sites along the river, says Tom Frye, managing director of the Nashville office of CBRE, a commercial real estate firm. “Most of it (the riverside) is in the flood plain, and there are environmental issues because much of it has been used for industrial uses over the years. You’d have to get past all that,” he says. It’s not that commercial development isn’t allowed on the riverside. It is. But the private sector hasn’t been very interested since the flood, at least as far as big, eye-catching projects right on the river are concerned. No one has proposed the next Opryland Hotel or Opry Mills shopping mall, perhaps because the two of them suffered millions of dollars in flood damages. Despite the recession, the private sector has been active in the area of downtown between the river and the interstate loop to the west. During the past two and a-half years, the city has issued permits for construction projects valued at $544 million in that 11-block area of the city’s core. Much of it is residential, such as Eleven North, the 302-unit luxury apartment complex that recently opened in The Gulch. The riverside hasn’t seen anything like that. A consultant suggested three sites for a new stadium for the Nashville Sounds minor league baseball team – one of them on the east bank of the Cumberland – but it would be funded by a combination of public and private financing. A ballpark at that location would replace PSC Metal, a 55-acre scrap yard that has been part of the Nashville skyline for decades. Moving the junk yard has been on the city’s agenda for years. “They want to move us, anybody and everybody,” says Troy Blanton, the company’s vice president of marketing. But a similar location, with access to river, rail and highway transportation, would be difficult to find, he says. “Everybody needs a landfill. They don’t want one in their backyard,” he adds. 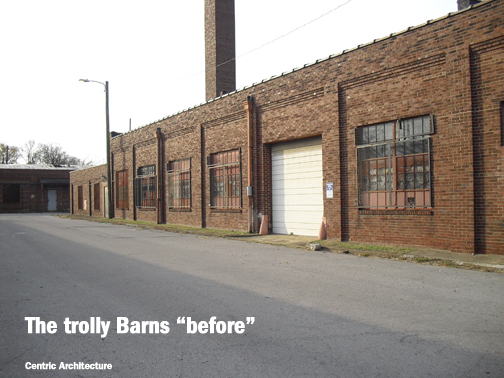 On the west bank of the river, the city has invested in the redevelopment of Rolling Mill Hill, a river bluff south of downtown that once was home to Nashville General Hospital. Ryman Lofts, with 60 affordable apartments for artists, should open at the end of the year. Nance Place, with 109 affordable apartments, is already open. “The views from the (Ryman Lofts) building down the river, of the skyline and of the river, are very attractive,” said Mark Drury, spokesman for the Metropolitan Development and Housing Agency, the project’s public sector developer. Metro Councilman Peter Westerholm, whose district includes much of the downtown riverbank, says the transformation occurring along the Cumberland’s edge is part of a national trend. “It’s a transformation from industrial uses to uses that create interaction, transit, destinations, more ‘highest and best’ uses than industrial use,” he says. Since the flood damaged at least 2,500 structures in the flood plain of the Cumberland and other waterways, the city has made a point of not prohibiting construction in those areas. In fact, a Metro committee, the Stormwater Management Committee, meets regularly to consider requests for zoning variances for development in the flood plain. Requests come from business and homeowners who want to build a garage or add to their house and discovered their yard is in the flood plain. Dale is part of a partnership that wants to build a residential development at the confluence of Mill Creek and the Cumberland River. He says it would not include the marina that the project’s previous developers wanted and is much smaller in scale. The partners also have promised to create a wetland on the 38-acre site. “On some low-lying property, allow low-impact development to happen,” Dale says. Others want to preserve the river’s edge as undisturbed public spaces, at least along the east bank, much of which is already park land. The city’s long-range plans include a riverside greenway extending from Donelson in the east to Bells Bend west of the city. “You could live in Scottsboro (a community in Bells Bend) and bike downtown and to the Donelson-Hermitage area,” says Audra Ladd, Middle Tennessee project manager for the Land Trust for Tennessee. Open-space advocates hope the city will reserve land adjacent to the river for agriculture use and tourism. “Nashville is evolving in its relationship with the river, from turning its back to the river, (with) many industrial decisions, to turning its face to the river, Ladd says. PSC Metal is committed to its riverside location, but some property owners have decided the river’s edge is not the place they want to be. At least 305 owners of homes in the river’s 100-year flood plain have participated in the city’s voluntary buyout program. Their property will be set aside as undeveloped land. And, after six feet of water filled its warehouse, one of Nashville’s most familiar names in business, the Ajax Turner beer distributorship, moved away. The flood destroyed a half-million cases of beer, prompting the company to move to LaVergne. A waterfront location can make a building difficult to sell, even a luxury condominium high-rise with a marina attached. Bank of America recently thought it had a buyer for the Braxton Condominiums downstream from Nashville in Ashland City. The buyer offered a figure around $15 million, just a fraction of the estimated $60 million it cost to build the condos before the flood, but then backed out. Now, as the flood of 2010 recedes into memory, Nashville has begun the process of creating a new community plan for growth along the river and elsewhere through 2040. The guidelines will continue the process started by Concept 2010, which guided growth between 1992 and the end of the last decade. The Metro Planning Department is forming citizen committees to make recommendations and is in the process of establishing a website for online discussions. The guidelines will be written over the next three years. The planning department hopes for “maximum outreach, maximum community involvement,” says Craig Owensby, the department’s spokesman. Concept 2010 devoted just a few paragraphs to the Cumberland, which, when it was thought of at all, was seen by many primarily as a reliable source of city water – 100 million gallons a day – and the convenient place where Nashville discharged the treated waste water from its sewer system. Now that the Cumberland has demonstrated its power, both destructive and as a source of enjoyment, the river is getting the attention it deserves.